Turquoise meaning has taken many different shapes over the course of history, When early civilizations discovered the stone, they were immediately enamored by it’s vibrant beauty. Many thought the stones were created by the gods to provide protection, fertility and healing. Those beliefs passed through countless cultures and civilizations and remain very strong, even today. Ancient Puebloans prized the gemstone above all else, even gold, as did Persians and even ancient Egyptians. Somehow, cultures from other sides of the world, who had never come in contact with one another, believed turquoise harbored the same powers. For at least 2,000 years, the Persians have mined the stone and used it to adorn buildings, monuments and themselves. They believed the stone could be used to indicate someone’s health and brought good luck. Many of the same turquoise meanings were adopted by the Egyptians, who cherished the stones and believed they could heal and strengthen the wearer. In the United States, turquoise is very closely associated with the Native American cultures, who believe turquoise meaning is very important to the well being of their culture. When offered as a gift, the Southwest Tribes believed the stone would provide the recipient with good fortune and protect them from harm. The stone was an important part of ceremonies for the Aztec tribe. 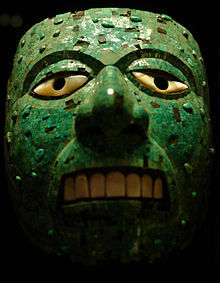 They would use intricate mosaic techniques to construct ornamental masks worn during ceremonies to honor the gods. They believed turquoise should only be worn by a great and powerful tribe, which they were. By the 15th Century, Aztecs had built cities and structures in central Mexico that rivaled even the largest cities in Europe. Aside from being a symbol of wealth and power, turquoise meaning also reflected the gods and Aztecs regularly offered the stone to their gods in exchange for good health. A common theme throughout many cultures are the general positive benefits of turquoise, perhaps because it’s color closely resembled the sky – where many civilizations believe the virtuous spirits live. Such turquoise myths are common in several cultures. Turquoise is also believed by many to be a sobriety stone that guides the wearer down the path to overcome substance abuse.